FULLY EQUIPPED and ready to SAIl PRICE!! ALL-NEW! Next Generation Sun Odyssey with "skow bow" hull design & "walk-around" decks! Available now in PR or USVI. This new model has revolutionized cruising: she is the first of the next generation (8th generation) Sun Odyssey's and features inclined "walk around" Side Decks for ease of movement from twin helms directly forward to the bow! Full Length Chine Hull with NEW "Skow Bow" design. Sailing performance and movement onboard redefined! With this next generation hull form evolution, Jeanneau has created a sailboat with tremendous buoyancy forward yet sleek and fast thru the water. When sailing the new 440 the bow stays "up" into the wind and rises slightly as she floats and skips thru waves and seas - unlike anything in the market today! The new Sun Odyssey 440 benefits from an entirely new, innovative layout for greater ease of movement and livability. Central galley with all storage low in the boat for reduced center of gravity and better sailing. True rectangular berths in all 3 cabins with ample headroom throughout. Master suite forward. All-New Alpi "Grey Oak" wood finish with bright white accents and lots of natural light with large rectangular hull ports, big windows, and lots of deck hatches. A must see for sure! 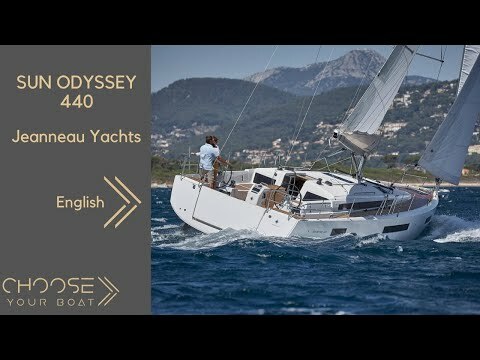 Seaworthy and welcoming, cozy and sporty, masculine and feminine, the Sun Odyssey 440 is as attractive on the interior as on the exterior. Be the first to own the next generation of Sun Odyssey's. Our arriving Jeanneau SO 440 is a 2019 model year hull stamps and will be ready for sailing. Inclined side decks to cockpit. No climbing over coamings, ducking under biminis or stepping on cushions. Extended coamings. Convert cockpit seating into double lounges on both sides. All controls to the helm with comfortable viewing angles. Main and Jib sheets. Set up for single handing. Many rig options with low boom. Ideally suited for performance mainsail. All berths rectangular for comfort and standard bedding. Performance, offshore, live-aboard cruising is a part of our DNA. Call or email Rose Ann today to discuss this new model in more detail or to reserve her for your sailing enjoyment!